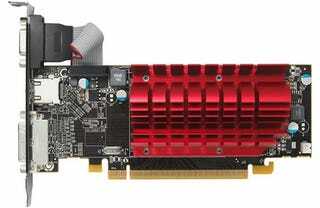 Well, this is nice: a Radeon HD 5000 series graphics card available on the cheap. It looks like you're not sacrificing much in performance, either: The $60 Radeon 5450 has full DX11 graphics and Eyefinity multi-display support. The $60 version comes with a 512MB memory configuration, and you lose a little speed compared to the 5800 and 5600 lines. But the 5450 is also optimized for HTPCs, with HDMI 1.3a with Dolby TrueHD and DTS-HD Master Audio.